The fourth ARJ21 aircraft delivered to Chengdu Airlines__Commercial Aircraft Corporation of China, Ltd. 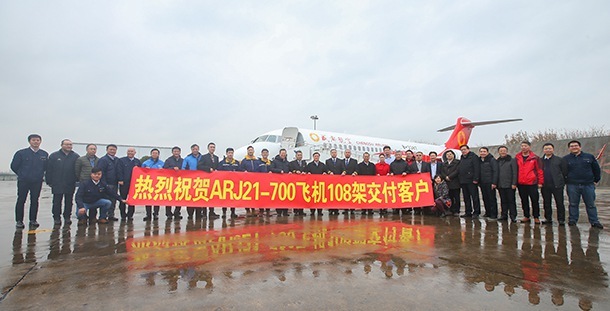 The fourth ARJ21 aircraft was delivered to Chengdu Airlines on December 28th, 2017. Commercial Aircraft Corporation of China, Ltd. (COMAC) delivered the fourth ARJ21 aircraft to Chengdu Airlines in Shanghai on December 28th, 2017. 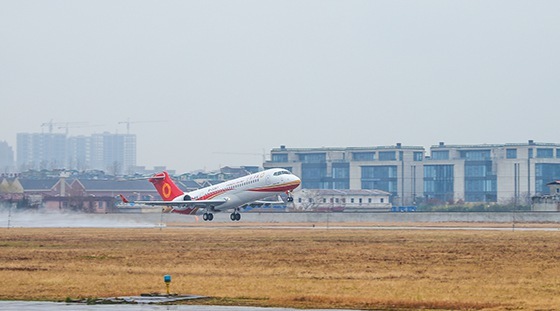 This is the second ARJ21 aircraft delivered by COMAC to Chengdu Airlines after ARJ21 aircraft has obtained the Production Certificate (PC). Mr. He Dongfeng, Chairman and Secretary of the Party Committee of COMAC, Mr. Liu Linzong, Deputy Secretary of the Party Committee and Vice President of COMAC, and Mr. Zhao Yuerang, Vice President of COMAC and General Director of ARJ21 Program directed the delivery on site at Shanghai Dachang Airbase. ARJ21 aircraft with nationality registration number of B-3387 took off from Shanghai Dachang Airbase at 13:01 on December 28th, and landed at Chengdu Shuangliu International Airport at 15:53 successfully after a flight of 2 hours and 52 minutes.